Throughout my adolescence, I was cautioned that “curiosity killed the cat”. In my case, it was curiosity that instead saved me. Being raised in a primarily white middle-class neighborhood brought socioeconomic comfort freckled with ignorance. Residents who fell into society’s “marginalized” category were few and far between. Having little exposure to people with disabilities, I felt uncomfortable in their presence. I was unsure of how to establish communication, if at all possible. I elected to stay within my comfort zone, within the parameters of my monochromatic community. This carried me through life comfortably until one day in my freshman year, when the ground shook and opened up before me. A nonprofit group needed a venue to perform their musical. My school offered to host their performance, and tech crew needed volunteers. I decided to try my hand at tech–perhaps learn something new–and was assigned the spotlight, where all that was asked of me was to point the spotlight at the right person at the right time. I was happy to get experience and hide in the light booth. At least, this was my plan until I met the cast. 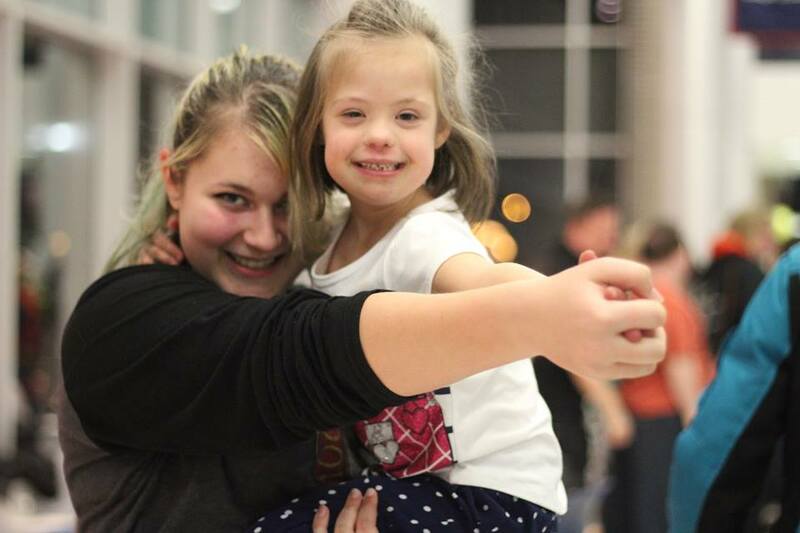 This nonprofit group’s members consisted of youth with Down Syndrome. I learned this too late, as I was standing in the middle of the main entrance when the cast first entered. I turned to begin my hasty walk back to the light booth. Before I could take two steps, however, I was being used as a tree branch for a girl with braces to hang on to. Grinning, she introduced herself as Eve and was promptly pried from me by her helper, Sam. Sam apologized for Eve and assured me it wouldn’t happen again. I found myself telling her that I didn’t mind. Later, I realized that I was telling the truth. Just two minutes out of my comfort zone had already affected me. As the week progressed, I met more and more people, each with unique aspects to their disabilities. At the final matinee, the director invited me to join them for the upcoming year as a part of their performance. “No way,” I thought. I was eager to return to my comfortable life. But I soon realized that my comfort zone was no longer of any use to me, that although a comfort zone is a beautiful place, nothing ever grows there. If I had any hope of being a compassionate individual, I had to stop making excuses that kept me ignorant. I found myself saying yes. Saying yes was the hardest thing I’ve had to do in a long time. Here I was, some ignorant, new person forced to adopt a new system of patience and understanding beyond that which I already knew. The shows came and went, but the lessons I learned persist. Spending two years with 70 kids whom I would never have gotten to know before shifted my values. I realized that “disabled” is a term that leans unfavorably to those it attempts to define. A person is not disabled, but different. The majority of people having a certain ability that another does not isn’t definitive of their character or of their worth. I challenged my understanding of intelligence, and stopped defining it through academic success. I have become a leader, and understood that a leader does not discriminate. Having learned this, I no longer live my life in monochrome, instead opting for a dash of colour where there used to be none. I have learned that success is never borne of expectation; it is borne of fearless giving. Presented with the situation again, I can only hope that my heart would follow that same curiosity; for there is no greater love than love that is shared. I have been playing and learning with EDGE of Orion’s Constellation Project as a peer actor since I was 11 years old. Through my experiences as a peer actor, I have developed as an individual, watched this amazing community grow, and had a ton of fun! When I first started as a peer actor I was intimidated, not by the prospect of playing alongside actors of different abilities, but by the natural fear of acceptance into a new community. What would this room full of people who I had never met think of me? That fear did not last. I soon found that the room that I had thought was just full of new faces, was also full of hope, compassion and love. The Constellation Project community is one of the most welcoming groups that I have ever been lucky enough to be a part of. I have been inspired and taught by other peer actors, the actors that are differently-abled, and the staff, all of them with kind and open hearts. I have been taught to befriend those around me, to enjoy and accept people’s differences. As the years have gone by, I have watched the Constellation Project grow and have watched both actors that are differently-abled and peer actors overcome challenges, as characters and as people. I have watched them graduate and move on in life. Yet the foundation of the Constellation Project has remained the same, despite these changes. An inclusive theatre group that connects stars of every ability to make beautiful constellations, communities with a mission of kindness, acceptance, and love. Basically, what I am getting at in this overly long essay is this - you should come be a peer actor with the Constellation Project. If you aren’t sure about participating, come watch one of our shows. See the pure joy that shines from everyone on the stage, as, no matter what their abilities are, they give the show their all. Not an actor? No worries, this community is as inventive as it is accepting, and they will help find the right role for you. Hope to see you in rehearsals!